Food is more than a means to an end. Yes, we all have to feed our bodies. But food should connect people together too. I've had a number of experiences in the last week that have made me think about the idea of people food. I went to lunch with my good friend and social enterprise mentor and investor David Smail. 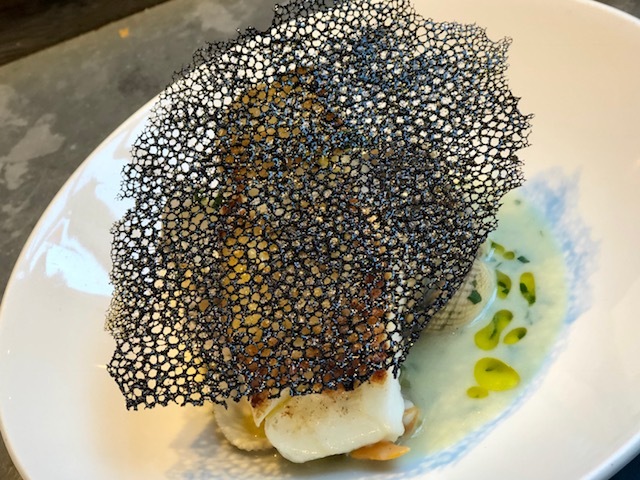 We went to 64 Degrees in Brighton and decided to share some really interesting food such as Skrei cod and cockles with squid ink, and anchovy tagliatelle with chicken skin. Sharing dishes bound us together and made it a richer experience. At the weekend we went to Napoli E in Westerham for my girlfriend Tracey's birthday. It's all about old school Italian hospitality there and everyone sung 'Happy Birthday' to Tracey twice - once in English and once in Italian. It made us part of a community of Italian food-lovers for an evening. I also cooked a curry during the week - perfect for the cold weather - and sat around with my family while we helped ourselves to curry, rice, naan and side dishes. We were all laughing, joking and going along with typical family banter. There was something about digging into food in the middle of the table that seemed like an enabler for conversation and enjoying family relationships. This got me thinking about how food for schoolchildren could be turned around. I was the keynote speaker at The Independent Schools' Bursars Association (ISBA) recently, attended by everyone from bursars to dinner ladies. Chatting to them afterwards cemented an idea that getting children to share food around a table could completely change their experience of school dinners. My children hate their school dinners, the long queuing times and the pile of chips and beans or similar foods they're given. The food isn't even freshly cooked - it gets delivered to the school in large vats. Having tables of mixed meals would really get food to speak for itself. It would create more enriching social interaction between children. And it would give them a healthier, more knowledgeable approach to different foods. My midweek curry. Could sharing food like this in schools turn school dinners around? I'd split the food into three elements to make food more exciting for them. The 'comfort' part might be noodles, potatoes or pasta. The 'healthy' part would be vegetables and salads - adding lots of vibrancy, colour and texture. The 'hero' would lift the whole thing off. It doesn't necessarily have to be a piece of meat or fish; it could be something that really jumps out like a piece of roasted squash or a chargrilled lettuce. Add a few bits and bobs like a sprinkling of roasted hazelnuts, or some crispy seaweed, and children could be more involved in designing their meals. These are the building blocks for their future lives and really can help them become stable, functioning adults. Whether it's sharing plates of food, using food to spark new ideas and conversations, or rooting people into meaningful daily rituals, people food is what mealtimes should be about. Knowing the stories behind food can add to the experience - becoming a talking point and a celebration of food. We use food as a foundation for giving homeless people the right nutritional basis and culinary skills to get their lives back on track, through the Beyond Food Foundation. Together with providing friendly and supportive people to talk to, a warm and safe environment and mentors, the approach really does work. However, I've been frustrated by the recent media coverage about the plight of homeless people during the cold snap. One poor homeless man died near Westminster because of the cold, and politicians rallied around to lay flowers and cards. But plenty more like him have died on the streets - during the cold weather and before it. Where have the politicians been until now? I'm part of a small coalition of homeless organisations that has been pulled together by SEUK. Crisis, St Mungo's, The Connection at St Martin's, The House of St Barnabas, Connection Crew and Change Please are all involved. We're working hard to refer people to charities and social enterprises that are the right fit for each individual. But homelessness is an urgent and growing problem. What people really need are meaningful jobs and support to stand on their own two feet. We offer some opportunities for this at Brigade and the Beyond Food Foundation, but we can't do it alone. At the most fundamental level, 'people food' is about nourishing people back into lives that mean something to them. The knock-on effect can be dramatic, fulfilling and wonderful. Curry is the ultimate people food. Here's my recipe for a warming lamb curry.